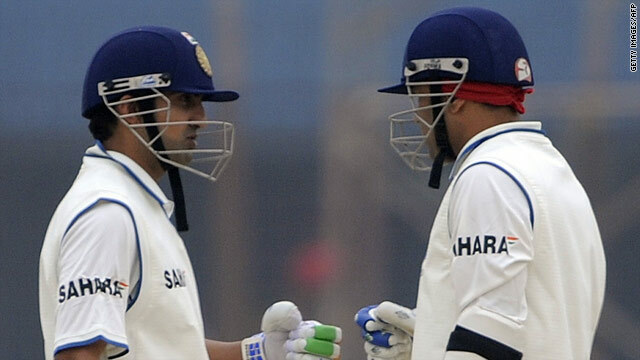 Gautam Gambhir and Virender Sehwag celebrate a boundary during their side's 413 for eight as Gambhir made a century. Gautam Gambhir struck his fifth century in successive Tests as India ended the fourth day of their first Test with Bangladesh in control. Bangladesh are chasing an unlikely 415-run victory target and will resume the final day on 67 for two. The Indian Premier League will be shown live on YouTube, IPL commissioner Lalit Modi confirmed to The Daily Telegraph newspaper. Gautam Gambhir struck his fifth century in successive Tests as India ended the fourth day of their first Test with Bangladesh in a commanding position. The left-handed opener made 116 as India declared their second innings at 413 for eight shortly after tea in Chittagong to set Bangladesh an unlikely 415-run victory target. The 28-year-old is only the fourth player in Test history to achieve the feat after Donald Bradman, Jacques Kallis and Mohammad Yousuf. India resumed on their overnight total of 122 for one and added 291 as Gambhir, VVS Laxman (69 not out) and nightwatchman Amit Mishra (50) dominated the Bangladesh attack. Bangladesh spinner Shakib Al Hasan finished the pick of the hosts attack with seven for 174, the best by a Bangladeshi bowler against India in a Test. The hosts will, though, face a stiff task to save the Test as they struggled to 67 for two in their second innings at stumps as they lost opener Imrul Kayes for one when he was caught behind off the bowling of Zaheer Khan. Shahriar Nafees (21) also fell before the close when he was caught at gully off Ishant Sharma with Tamim Iqbal (23 not out) and Mohammad Ashraful (16no) set to resume on the final day. Gambhir revealed his surprise and delight at reaching the feat but insisted the team takes priority over individual achievements. "I never thought I would get five centuries," Gambhir told reporters at the end of the day's play. "My job is to go out there and keep scoring runs for the team. The most important thing for me is to give the team a good start." Elsewhere, the Indian Premier League will be shown live on YouTube after the IPL commissioner Lalit Modi confirmed to The Daily Telegraph newspaper that a deal has been struck with internet search giant Google. The move will see the IPL become the first sporting event to broadcast live on the internet in every country on a dedicated YouTube channel. Modi said: "This changes the world of sports broadcasting. The internet has changed the lives of everyone and this will do the same for sport. "We are now taking our event truly global for the first time. Google gives us access to 500 million pairs of eyes every single moment of the day. "There are a few countries where the feed will be near as live which means there will be a delay of only a few minutes, but most places will be able to see live streaming of the action."